In our fast-paced society, we face an abundance of food choices every day. On top of that, distractions have shifted our attention away from the actual act of eating onto televisions, computers + smartphones. Eating has become such a mindless act, often done quickly. But by eating mindfully, you restore your attention + slow down, making eating an intentional act instead of an automatic one. Here are five simple ways to eat more mindfully: 1) Eat more slowly + don't rush your meals. 2) Chew thoroughly. 3) Eliminate distractions by putting down your phone. 4) Eat in silence. 5) Focus on how your food makes you feel. My favorite way to start my morning meditation practice is with mindfulness. As I settle into my space, I start by just noticing how my body feels + what sensations are happening in my body. Then I gracefully begin to tune into my breath, sending it to the areas of my body that are more tense or tight. I also use my breath to release tension + further relax my body into a state of peace. Once my body feels centered + calm, I turn my attention toward my mind. I notice the thoughts that are present and observe my mind for a few minutes to bring focused awareness to my mental state. I become an attentive observer. If my mind is scattered, I remind myself that some days are better than others, and I begin to let go of what is no longer serving me in the moment. I use mindful breathing to release until my mind is steady + quiet. The duration of this process depends on how my body + mind feel that particular day. Then I draw my attention inward to begin my time in silence with myself. Try beginning your meditation practice with these mindful awareness steps the next time you take a journey inward. Mindful walking is one of the greatest activities you can practice to be fully present. When you walk, you can be totally engaged in paying attention to every step, breath + sensation. The cadence of your walk + your breath can become a form of meditation in itself. Free your mind of distractions, and allow yourself to truly be in the moment. Enjoy the sights, sounds + aromas. Engage all your senses. Witness them awakening without the burden of thought. Your walk can include a state of gratitude—with lots of positive self-talk—or you can concentrate on the way that your body moves + the way that your breathing feels. Remind yourself to breathe smoothly + rhythmically, and most importantly, to relax + release any tension in the body. Breathe deeply. Roll your shoulders back and down away from your ears. Be loose. Be soft. Smile. Let your arms be free, swinging them from side to side. In a world where there’s so much to be taken seriously, it’s important to remember to laugh. Laughter meditation is an effective + easy way to access joy, pleasure + connection. Practice laughter meditation and embrace all it has to offer your mind, body + spirit. Here are five healing benefits you receive from laughter: 1) Presence 2) Lightness 3) Connection 4) Stress reduction 5) Emotional release. It’s one of the easiest forms of meditation. Just start by stretching your body, practice laughing + end with some silence. Mindfulness is defined as “moment-to-moment awareness”—being fully awake + fully present for every moment of your life. It gives you the ultimate tool to transform your life + provides a concrete way to create global change. Mindfulness is the cornerstone of mindful living and should always be your focus, but you must start small. By starting with yourself, you have the power to truly make an impact in the world. I think the most effective way to incorporate mindful living is to create rituals—reminders to stay mindful + bring yourself back to the present moment. To trigger peace in your life + put your well being first. A ritual is a way of saying, “I'm taking care of myself.” What’s one healthy ritual you can create for yourself right now? Heather is a Phoenix, AZ, native. In high school, she began practicing yoga to cultivate a deeper mind, body and soul connection. After graduating from Arizona State University, she completed her 200 Hour Yoga Teacher Training at LifePower in Scottsdale, AZ. During teacher training, she studied the Yoga Sutras of Patanjali and learned that taking class and practicing the poses, or asana, only constituted a small aspect of yoga. After fully comprehending that yoga is designed to facilitate meditation, she transformed her practice and philosophy. Heather believes that when teaching yoga and meditation, taking a vulnerable and authentic approach empowers each student to embrace their true selves. She is dedicated to helping her students remove the barriers that block the path to the best versions of themselves. Heather created Meditate Movement as a way to explore, experience and share different types of meditation with the world. Meditate Movement is a platform for like-minded individuals to come together to gain both insight and an elevated understanding of mindfulness practices. Heather also works at The Chopra Center in Carlsbad, CA. Follow Heather on Instagram at @meditatemovement. 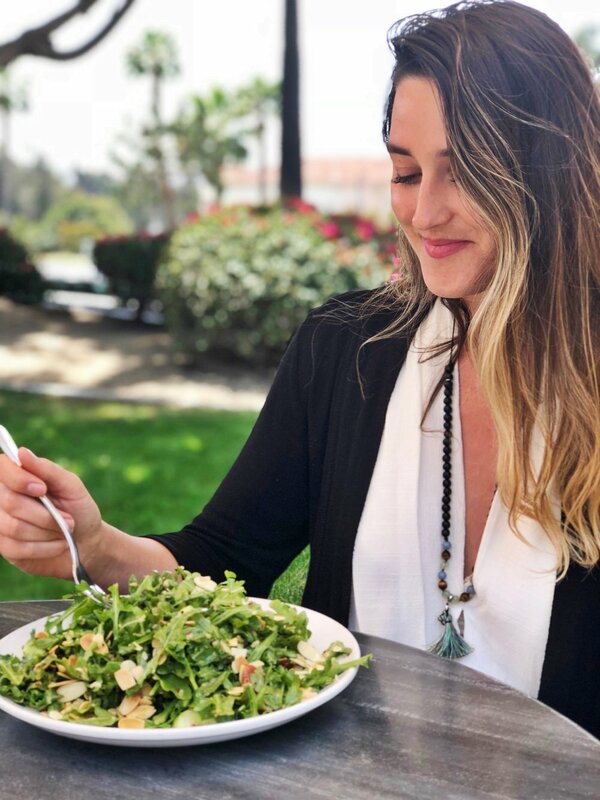 Heather is wearing pieces from the Be Mindful collection, designed to help you live a more mindful life. For each piece of the Be Mindful collection purchased, Mala and Mantra will donate $5 to The Center for Mindfulness at UC San Diego Health to help fund mindfulness research + community outreach. Shop the collection here.